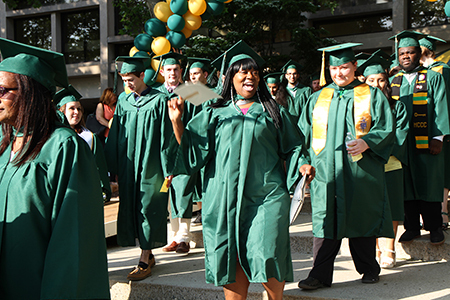 Happy grads reaching the finish line. Physical Therapist Assistant grads express their joy on their caps. 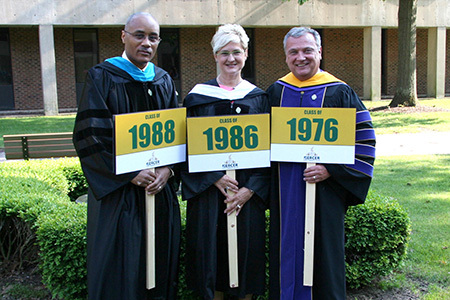 From left, alumni Commencement speakers Rodney Thompson, Tammy Duffy and Jack Lechner. Associate Professor James Maccariella, coordinator of Engineering Science, was the recipient of the the Distinguished Teaching Award. Student speaker Cody Willever, R.N., delivered a high-energy address as he congratulated the Class of 2017. 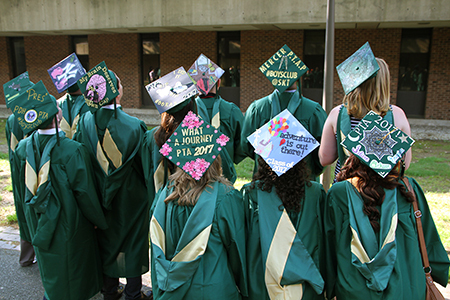 Alumni dating back to 1961 when MCCC was known as Trenton Junior College added a special flavor to the 50th anniversary Commencement. O'Dean Eccleston, who served as president of the African-American Student Organization, will transfer to The College of New Jersey in the fall. Mother and son Angela Murphy and Aaron Jones-Murphy proudly graduated together. 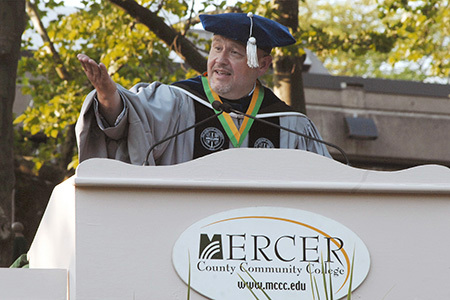 West Windsor, N.J. – Messages of inspiration filled the quad on the West Windsor Campus of Mercer County Community College (MCCC) as MCCC hosted its 50th Anniversary Commencement May 18. 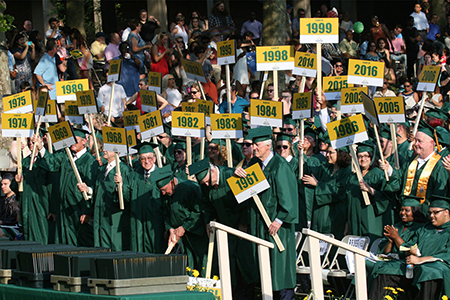 The college conferred degrees and certificates to 1,058 graduates in a ceremony that marked the conclusion of the college’s 50th anniversary year and featured the participation of alumni from almost every class – including Jack Rafferty, a 1961 graduate from the former Trenton Junior College, who went on to become the mayor of Hamilton, among his other accomplishments. Board Chairman Mark Matzen greeted the graduates and the hundreds of well-wishers who came out to cheer them on. He observed that more than 30,000 students have graduated from MCCC since the college accepted its first class in 1966. “Just like them, some of you will go on to four-year colleges. Others will embark on exciting careers. 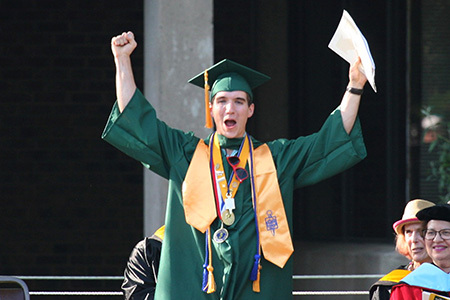 Wherever your life journey may take you, we hope Mercer has prepared you well,” Matzen said. President Jianping Wang welcomed the graduates and their families, and introduced the notable guests seated on the dais, including Board members, County Executive Brian Hughes, members of the Mercer Board of Chosen Freeholders Board and guest speakers. Dr. Wang pointed to numerous graduates who have been stellar scholars and student leaders. Among them are Emily Jaruszewski, who received her associate degree in Mathematics and will earn her high school diploma from Mercer County Technical Schools’ Health Science Academy next month. She will attend Smith College in the fall. Another grad, Taylor Shimko, began dancing with the Rockettes directly after graduating from Ewing High School and has attended Mercer part-time since 2011 to earn her A.A.S. in Business Studies/Business Management. (Shimko will continue for her bachelor’s degree online at Thomas Edison State University.) 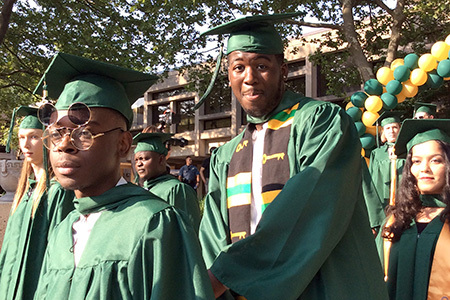 Eight Equal Opportunity Fund graduates will transfer to four-year colleges, including O’Dean Eccleston, president of the African-American Student Organization, who will attend The College of New Jersey in the fall. 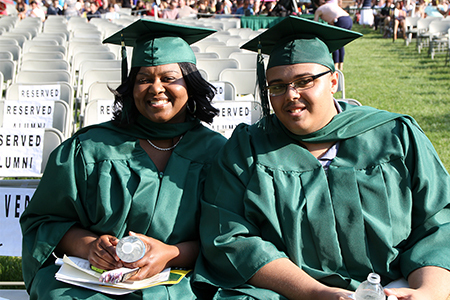 A mother and son, Angela Murphy, an Education major, and Aaron, an Entertainment Technology major, studied together – and graduated together. County Executive Brian Hughes encouraged graduates to continue to ask the difficult questions and have the confidence to engage in critical thinking. "These tools will stay with you and add to your success no matter your path," he said. Three Mercer alumni, representing the college’s three divisions, addressed the audience as commencement speakers. Dr. Rodney Thompson ’88 (A.S., Liberal Arts) is a Trenton native who went on to earn a law degree from Syracuse University and was chief municipal court judge in Trenton before being appointed to the New Jersey Superior Court in 2016. Tammy Duffy ’86 (A.A.S., Radiography) went on to earn a doctorate in Health Physics and more recently launched a second career in fashion design. Jack Lechner Jr. ’76 (A.A.S., Funeral Service) worked as a funeral director for 10 years and then joined the military, eventually being promoted to colonel. On the verge of retirement, he was appointed to a position at Arlington National Cemetery, where ultimately he became superintendent. Currently he is the president of the Cincinnati College of Mortuary Science. In his remarks to the Class of 2017, Lechner reflected on his personal journey, noting "Don't expect everything to go as planned." A special highlight of the ceremony was the announcement of the Distinguished Teaching Award, which is based on recommendations from students, faculty and staff. Described as “energetic, smart, innovative, a mentor, and one of the best examples of what a teacher should be,” Associate Professor James Maccariella, coordinator for Engineering Science, accepted the award with the humility and good humor that has endeared him to so many at the college. The lead faculty member for the college’s S-STEM Scholarship program funded through the National Science Foundation, Maccariella said, “I get credit for things that we do as a team,” citing the contributions of fellow faculty members Laura Blinderman (Biology), Helen Tanzini (Chemistry), and Richard Porter (Mathematics). Noting that enrollment in STEM programs has tripled since he began teaching at Mercer in 2009, he commended faculty members Harry Bittner and Dom Defino (Electrical Engineering Technology), along with Dean of Business and STEM Winston Maddox. But he observed that singular devotion to work can come at the expense of time with family and friends. “Shoot for your goals, but appreciate the people around you. Life is about the journey,” he said. Willever noted that his participation as an officer in the Mercer chapter of the Phi Theta Kappa National Honor Society helped him development leadership skills. He also praised the welcoming, diverse community of students he discovered at Mercer and thanked the Nursing faculty for its unwavering support during his four-year journey to become a nurse. “Pursue your dreams and always believe in yourself,” said Willever, who will continue for his B.S. in Nursing through the college's on-campus partnership with Rutgers University-Camden.